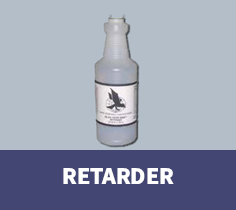 Other Additives LP | Hawk Research Laboratories, LLC. 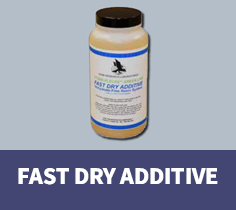 Use the Retarder additive in high temperature work areas (90ºF or more) to slow the solvent evaporation rate. This rich, slow solvent increases flow out for improved gloss levels and can also be used to remove halos from chip repairs. Fast Dry Additive can be added to StoneFlecks™ Ultra multicolor finish prior to application, allowing you to topcoat in as little as 15 minutes. This formulation aids film leveling and increases moisture resistance of the multicolor coating. Contaminants on the surface or in spray equipment can sometimes cause surface tension issues such as fisheyes and pinholes. Residuals from silicone caulks and sealers can also contribute to these defects. While there is no substitute for proper surface preparation and equipment maintenance, sometimes these issues can randomly occur. 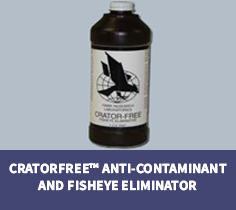 The addition of Hawk CratorFree fisheye eliminator can help mitigate these issues. Add 0.5 to 1.0 ounce per mixed gallon of material. 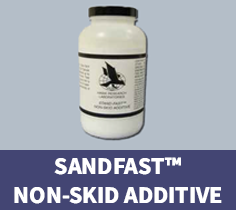 Use StandFast traction additive to apply a slip resistant finish to the surface. This polymer formula offers 100% compatibility between coating and additive. The traction additive particles become an integral part of the cured coating.